Would it be possible to already show the end result of a project during the starting phase? In this time; definitely. The architecture company Nohnik created ten different scenarios for generating sustainable energy. To simplify the decision process for the scenarios Nohnik wanted to visualize their plans. "The end result already visible during the starting phase"
Nohnik came up with 10 different scenarios to generate energy with solar panels and wind turbines. 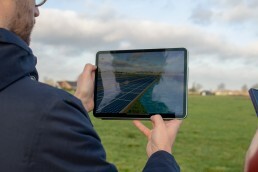 To visualize these plans an augmented reality app was created. The technology of the ARKit was used to show the different scenarios on location without needing a marker. Through the app residents and policy makers could experience the end result without it being actually build. By visualizing the scenarios, Nohnik was able to offer a better picture of the final result. All parties could see what the possibilities were and could make a decision based on this. This lead to a simplified decision process.